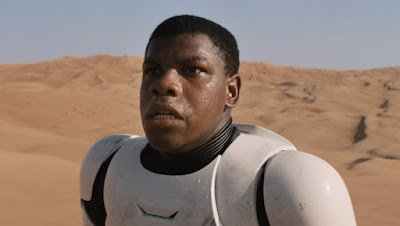 Star Wars: Episode VII The Force Awakens is now just 77 days away, and one of the characters we can't wait to learn more about is John Boyega's Finn. Lucasfilm has intentionally kept the character's history in the dark. Now, Cinelinx has heard some new rumors about the character's backstory, specifically about his time in The First Order. As usual, there is a chance this may not be true but if you are trying to avoid all The Force Awakens spoilers then stop reading now. This is your SPOILER ALERT! According to Cinelinx, the reason we don't know Finn's last name in the film is because the character has no last name. Jordan at Cinelinx writes, "The First Order isn't huge on names, and much like the Empire before them, have all of their people go strictly by numbers and designations." He also points out that there is precedence for this in the Empire, as seen in Claudia Gray's novel Lost Stars. They also report that the reason Finn can use a lightsaber in The Force Awakens, without necessarily being Force sensitive (not to say that we know that he that isn't) is that The First Order trains all their stormtroopers to use both lightsabers and shields. This would be done as a call back to classic Ralph McQuarrie paintings, which features stormtroopers using lightsabers and shields. "Apparently Finn is Captain Phasma's protege of sorts. I don't know to what degree, but it sounds like she takes the trooper under her wing during training. This would explain why Finn is part of a mission with Phasma and Kylo at the beginning of the movie, and could be part of the reason why she takes a more personal interest in tracking him down." That would add an interesting dimension to Finn's decision to desert his post. Also, I like the idea of The First Order not allowing any individuality among its ranks. Overall, I like these rumors. I think they give Finn a unique backstory, unlike anything we've really seen in Star Wars up until this point. Interesting! We have all been assuming Finn is a Jedi- but this puts an interesting spin on things...I hope ALL stormtroopers don't have lightsabers though...that night cheapen them a bit. But I like the idea of having saber-troopers like the original artwork. This also lends credence to the rumors of phasma having a saber and the rumors of seeing multiple red lightsabers in the film. I buy it personally. I'm also just releaved that Finn is not related to mace windu or lando...that would just be dumb and racist. I never assumed he was a Jedi. It would be like taking the scene from Empire where Han uses the Luke's lightsaber to cut open the Tauntaun without any background of the character whatsoever (like the short scene with Finn). He might just have ignited it to try to defend himself against Kylo! But we won't know for sure until more details are revealed. Mentioning Lost Stars is invalid. "Legends"
Makes no sense for stormtroopers to have lightsabers when Kylo's is a homemade jacked up saber. I hope they don't have stormtroopers with swords of any kind. I'm okay with the Mandolorians with their ancient traditions have their own special black sabers but to have "standard issue" swords for troopers is really taking away from how unique and cool lightsabers are in the SW galaxy. Not sure how Finn being a descendant of Mace Windu or Lando would be "racist". For the sake of storytelling, it's no different a story element than Ray or Kylo being descendant of a "white" person. Skin color is irrelevant. Both ways. Exactly how would that be racist? I find it interesting that it is always about why Finn can't be this thing or that that thing. First it was a stormtrooper and now it is why he can't be a Jedi. There are many out there that would love it if Finn just disappear altogether. Take your own advice, jangorick. Xox is right. Too many people love to rush in and claim what Finn won't be or can't be. No other limitations are placed on any other new character in that manner. And yes it started with the "he can't be a jedi" nonsense. overtime a new teaser, spoiler or news surfaces regarding Finn people end up scrambling to explain it (or explain it away) because it defies their expectations for the character which must have been pretty low. These latest spoilers confirm info and speculation that has been floating around for awhile on the net as well as add a new wrinkle. But these spoilers neither confirm or DENY that Finn is force sensitive, they merely explain why he may feel he can handle a lightsaber (which apparently he uses various times during the movie). And I specifically use the words "force sensitive" because no one in their right mind should expect Finn to be a jedi in TFA. Not yet. He would have had no time to learn. Was Luke a jedi at the end of ANH? No. But he was force sensitive. Lastly people need to stop comparing Finn using the lightsaber to what Han did in ESB. Was Han using it as a weapon? That lightsaber wasn't even in Han's hands for more than ten seconds. Do you think Disney would k d approve of promotional and merchandise posters with Finn holding a lightsaber if his use of the weapon was in the same vein as Han's? Meant to write "every time" instead of "overtime". Thank you, as a black male I'm tired of things always supposedly being racist. Just like in relationships when it comes to cheating. If you look for it hard enough, you'll find it whether it's true or not.